Happy Monday, friends! 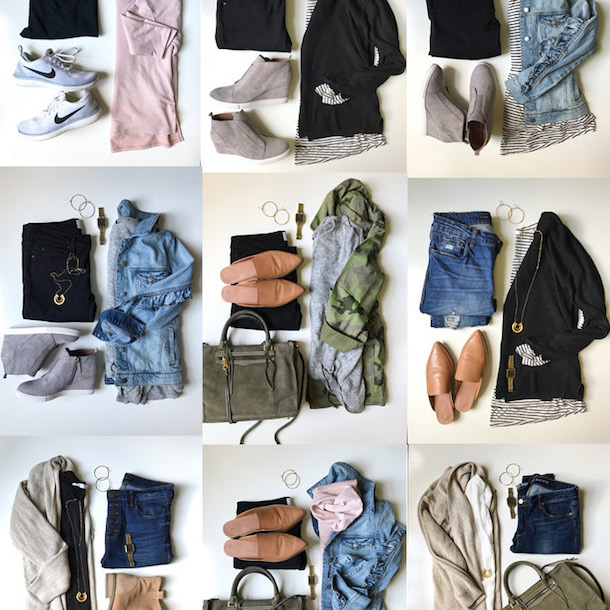 I’m easing you into the week with some super EASY and equally cute Fall outfits and, better yet, there’s a GIVEAWAY for you to win a shopping spree to Lilla P at the end of this post! 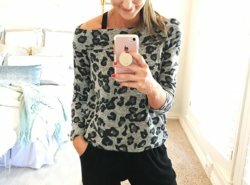 While I normally opt for price conscious trend tops, I know that great basics are worth a bit of a splurge. 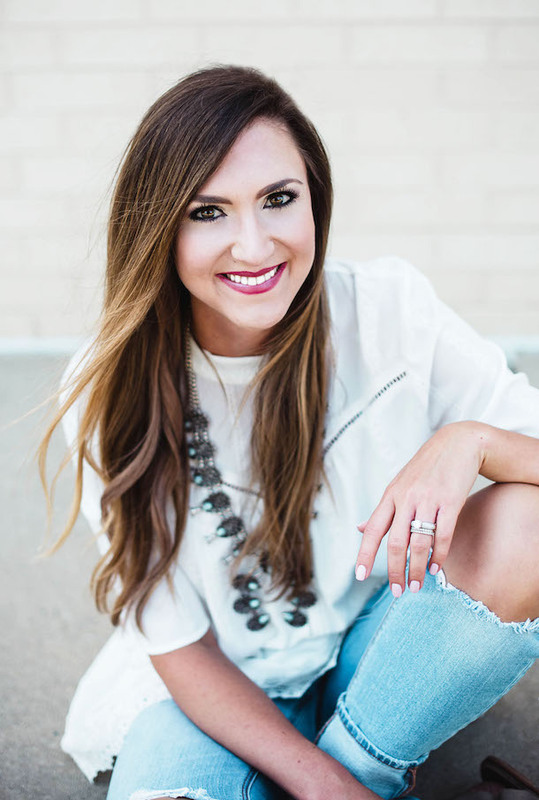 When I discovered Lilla P, I immediately fell in love with their high quality fabrics, classic cuts and on trend colors. 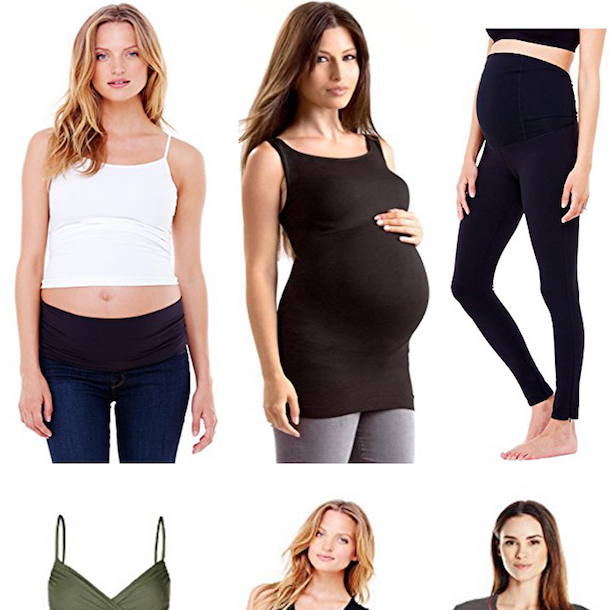 They totally cater to the busy mom who wants to look effortlessly chic, but appreciates a great quality piece that will stand up to consistent wear and an on-the-go lifestyle. 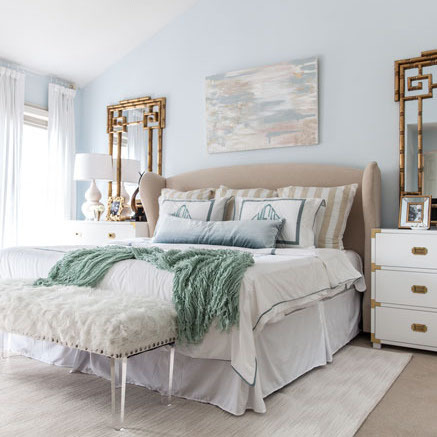 I styled two pieces below and Lilla P is generously offering a $250 gift card to one lucky reader at the end of this post! 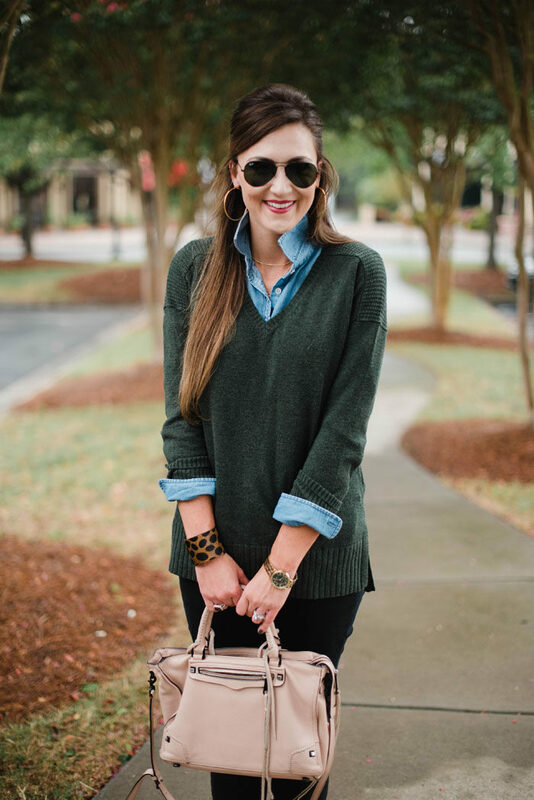 This hunter green sweater is a cotton + cashmere blend (making it so comfy and soft!) and is the ideal length….not too long, but long enough to cover the bum. It’s more of a boyfriend fit and is perfect to layer with. 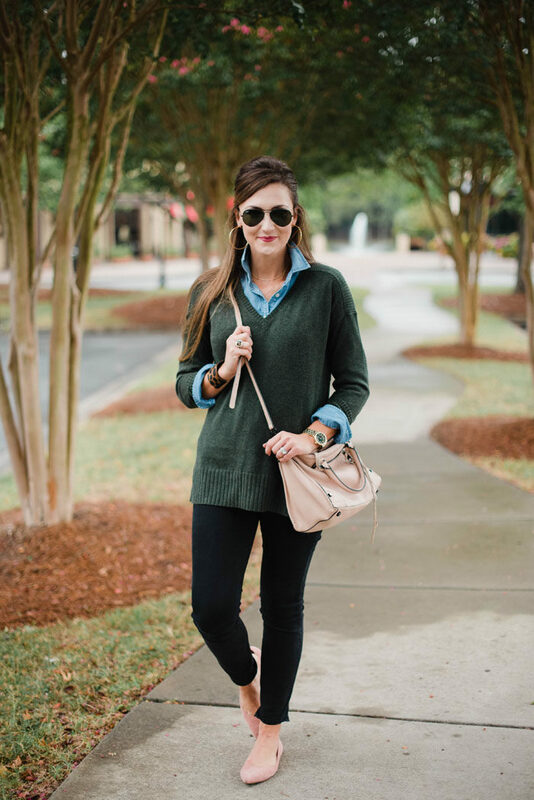 I love the look of this dark green layered with my go-to chambray button up and accented with blush accessories. 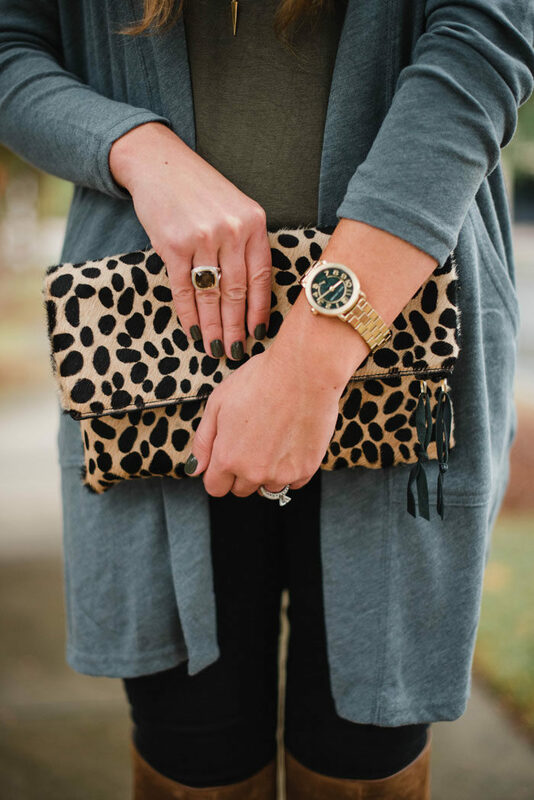 Ladies…two things…this leopard cuff is something that you need NOW! I’ve been wearing it non-stop and it’s a great Fall accessory…best news?? It’s $15! I snagged a few for Christmas gifts (gasp!) as well. Also, a few people have recently asked how my Rebecca Minkoff bag has held up. Well, this one is nearly a year old (and I’m notoriously rough on my bags), and you can see that it’s held up amazingly! Shop all of the beautiful colors, HERE. 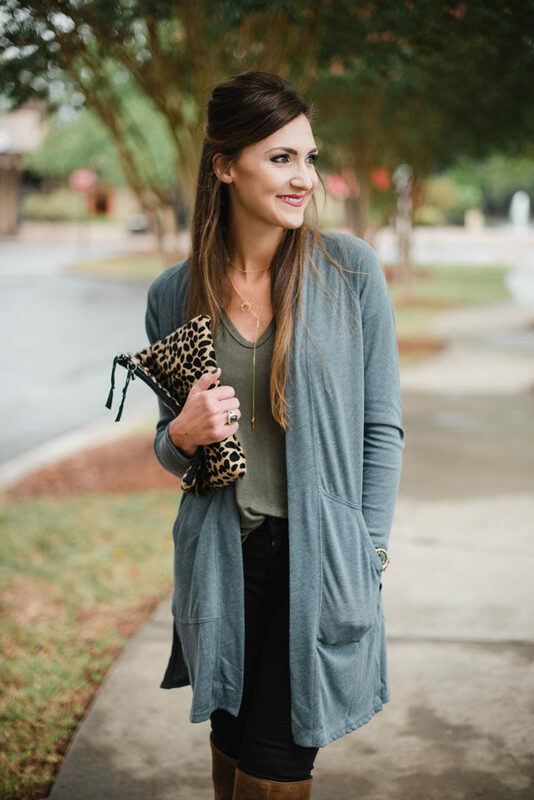 Next I’m styling this gorgeous duster cardigan. It’s the most comfortable thing of ever and I’ve already worn it more than I should probably admit. 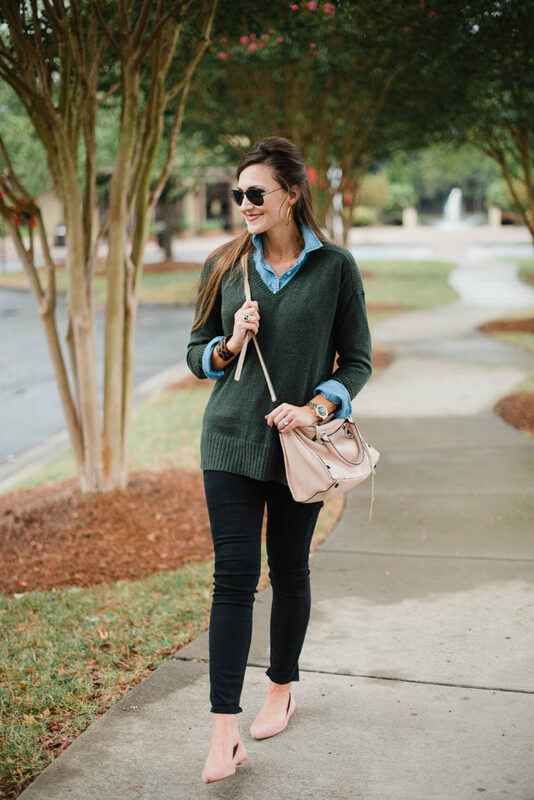 It’s as easy as throwing over your go-to t-shirt and pairing with skinny jeans and boots for a casual and pulled together look that’s beyond comfortable! You guys know how much I love my gold y-chain necklace, so I decided to snag this gold crescent layering set to pair with it and I love to delicate look! 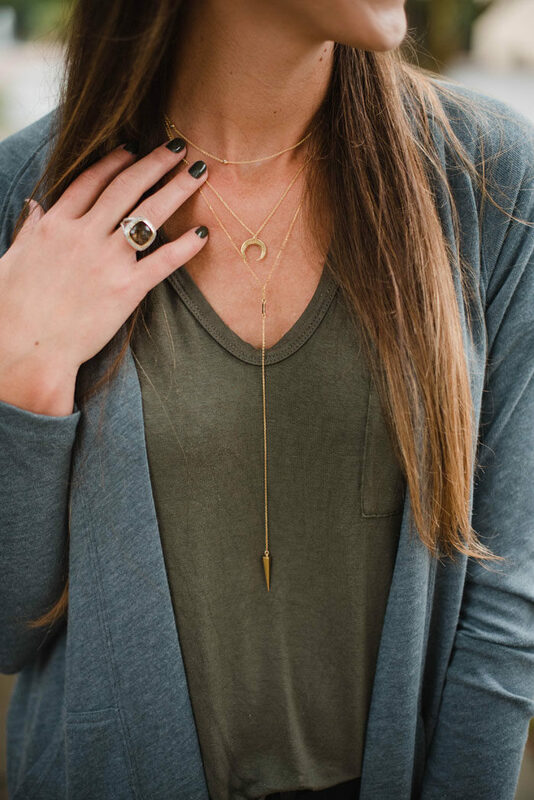 You can wear either of the 3 necklaces alone, but paired together they create an understated, delicate look that takes a simple v-neck tee to the next level. Soooo many of you loved this olive green nail color on Instagram, so I’m linking it HERE. It will definitely be on repeat this Fall! So what do you guys think…pretty effortless, right?? 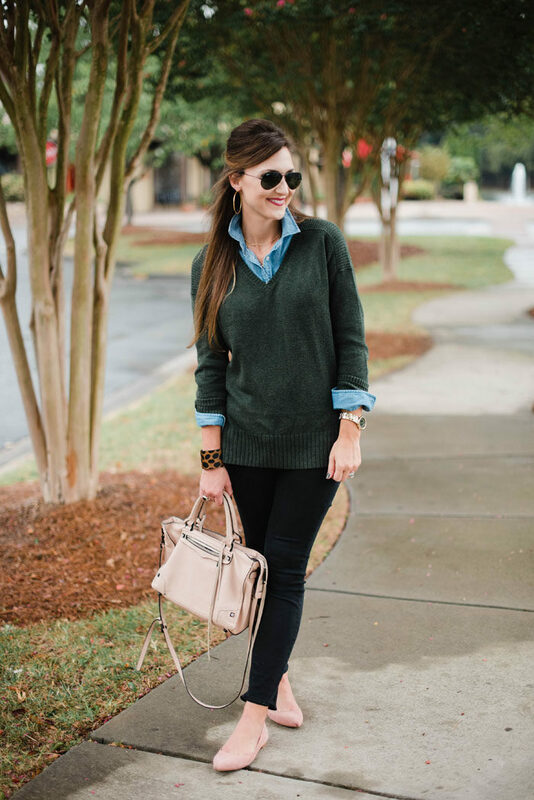 These pieces are easy and chic and (most importantly) they are high quality and will last in you closet for years to come! Now, it’s your turn to go shopping!!! 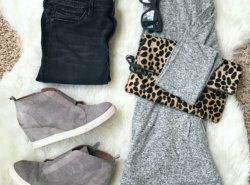 LillaP is offering one lucky reader a $250 gift card to snag some Fall staples and it’s so easy to enter…see below for details! 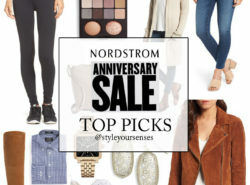 Nordstrom Anniversary Sale | Ultimate Shopping Guide!!! Love these looks!! And that cuff !!! Thanks so much, sweet friend!!! Wow, what gorgeous items, love them all, so fun! my kids went to the neighbor’s to play so i had time to enter! 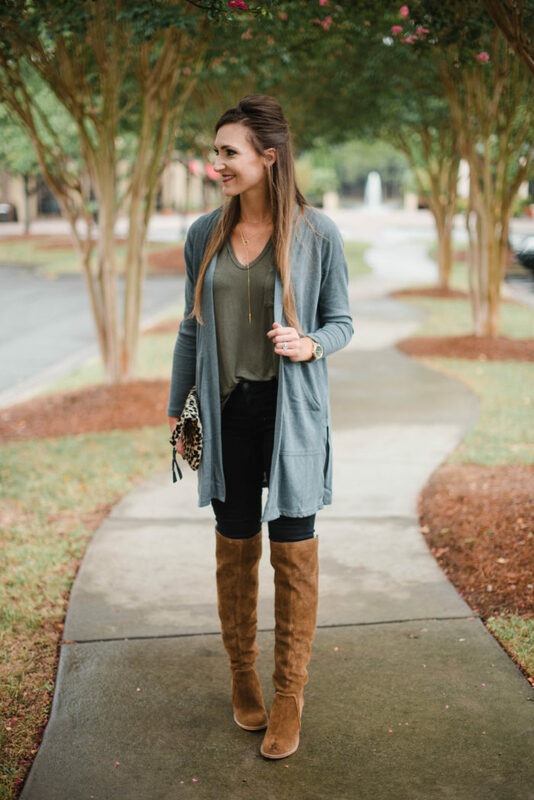 love that duster cardigan- it’s very me! you are sooooo gorgeous. 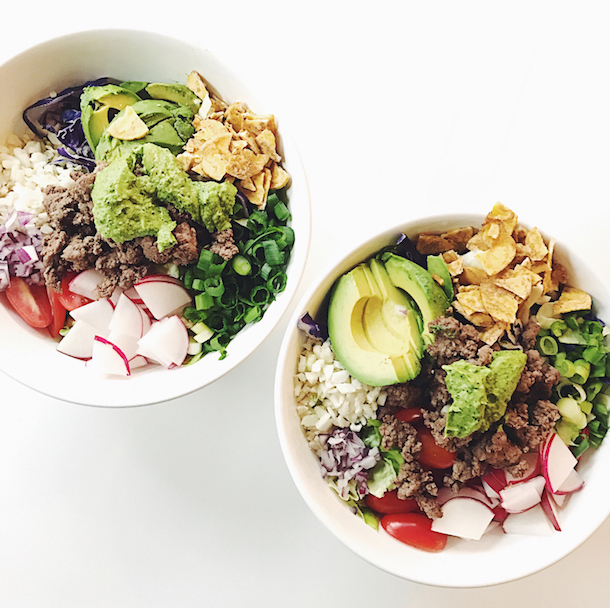 I love how you layered these pieces. 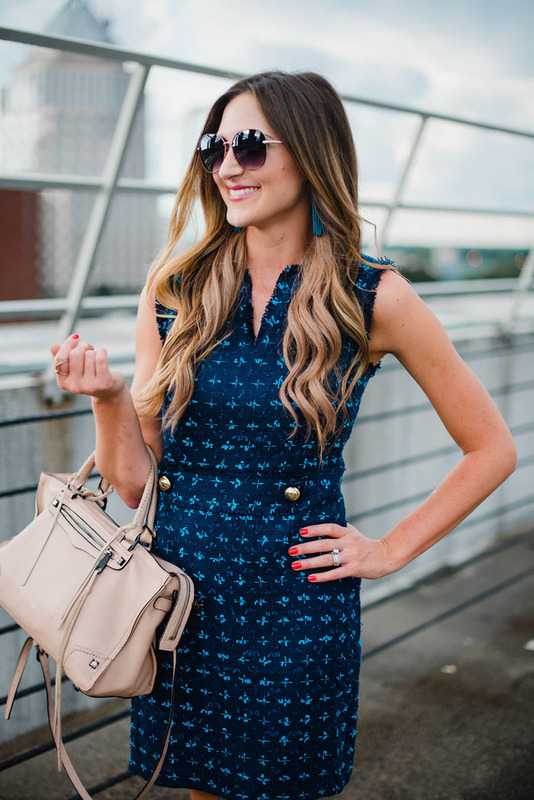 Looks effortless and chic! OMG! 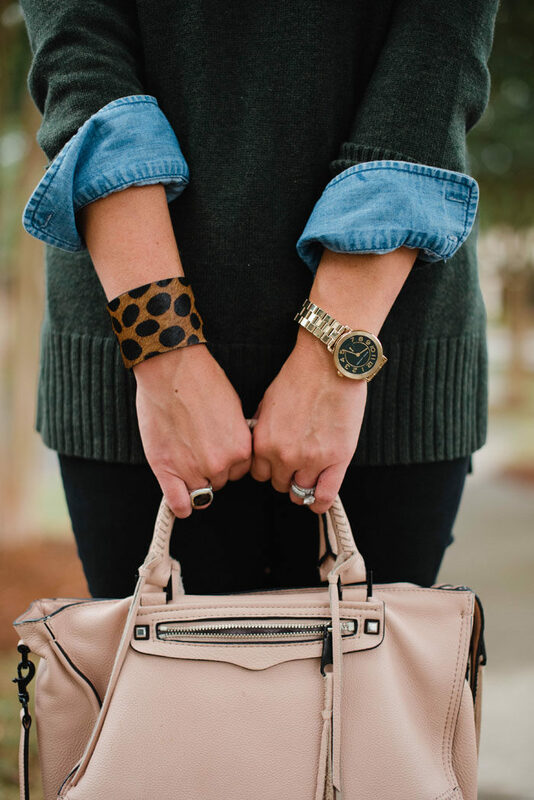 I adore those cheetah print pieces! Makes me so antsy for a cold Fall! girl, me too! Bring on the sweater weather!!! 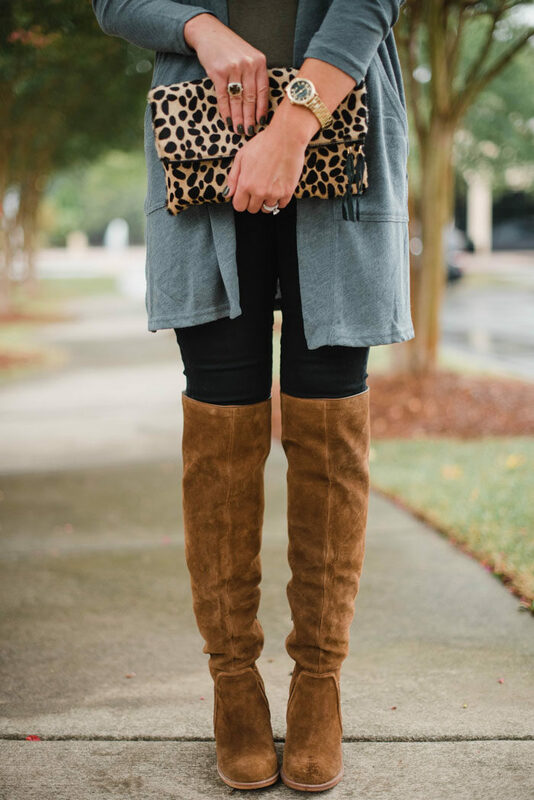 I love layered pieces! Love all these clothes! 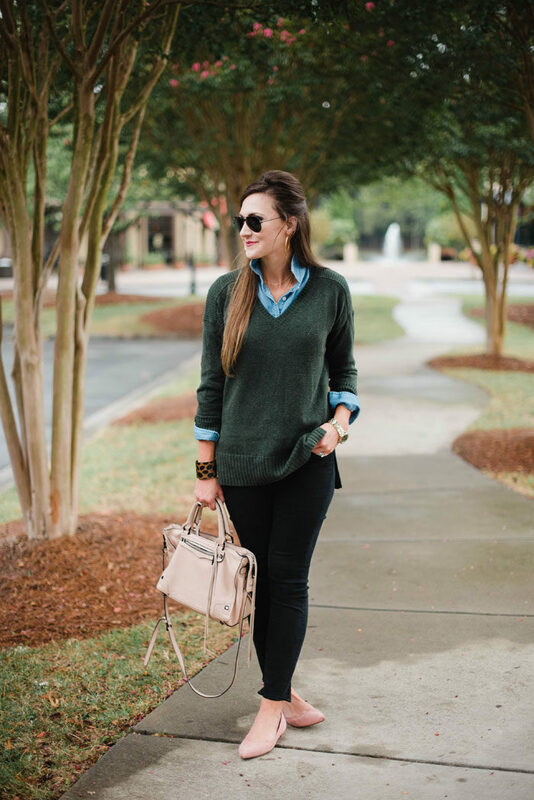 Love the green tee and grey cardigan! How does the tee run size wise? Thanks!